Wooden Camera said the new matte box is positioned as a mid level option between Wooden Camera’s high end, UMB-1 Universal Mattebox and the original, rubber Zip Box. The lightweight and compact matte box weighs about 12 ounces, is compatible with various diameter lenses and can accept three 4x5.65 filters that are loaded from the front. One or two filters can be tilted by offsetting them in the filter tray and leaning them back into the housing. The included top flag is made of lightweight carbon fiber which also covers the front of the matte box for protecting the lens. 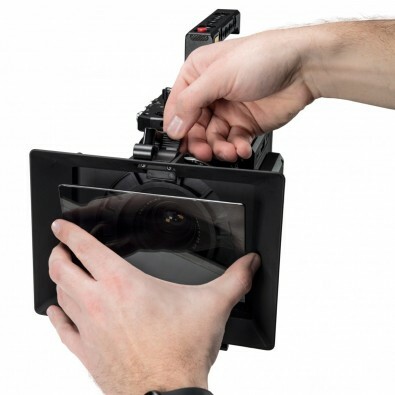 Zip Box Pro is available in both Clamp On and Swing Away options that are convertible by removing the matte box backs. The Zip Box Pro Swing Away ($499) attaches to 15mm lightweight rods and swings away for lens changes. Swing bracket includes the ability to tilt by loosening two screws on the side. The same two screws also allow for vertical adjustability of 4mm up and 4mm down from lens center. The Zip Box Pro Clamp On ($399) attaches directly to the front of a lens using dedicated backs of 114, 110, 104, 100, 95, 87 and 80mm. Backs can be swapped without tools using the four thumbscrews.